...where the mouth is better positioned, but still doesn't look quite natural (I'd say slightly more to the right). This version has other problems, too: it zooms in on the characters more, but the result is that Brain is chopped away, which looks especially odd with one of his arms still visible. 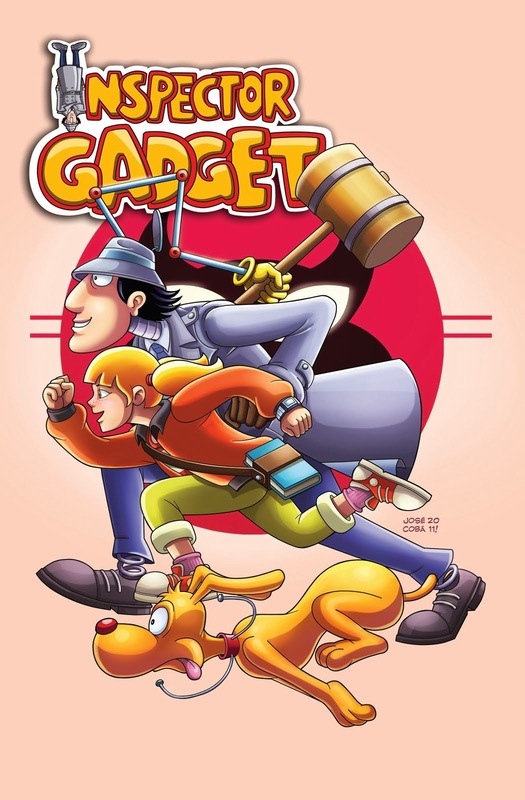 Since Gadget's mouth is better placed here, I'm guessing this is the version we'll be seeing on the physical DVD editions... though I much prefer version 1 otherwise. 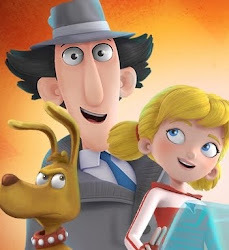 I think Gadget's non-smiling mouth here looks much better, not just because of the situation - he's on duty and serious about his work - but also for the facial expression as a whole. Is it really that important that all the good guys are smiling on a DVD cover? I'd say the most important thing is to show off their personalities. Finally, some practical info about the DVD. As I've mentioned once before, the Australian Government's classification lists Volume 2 with a runtime of 130 minutes, so I assume we'll be getting the next six half-hours here, #8 through #13. (Another reason I'm assuming this is that only the first 13 half-hours of season 1 were launched for the initial premiere on Boomerang.) Also, as with Volume 1, I'm assuming a 1080p release on iTunes Australia will pop up concurrently with the physical DVD on June 18. The DVD can currently be pre-ordered from retailers such as Ezy DVD, JB Hi-Fi and DVD Warehouse, as well as this, this and this Ebay seller. There's also a possibility for Australian residents to win it for free over at smoothfm. ...oh, and one more thing. I thought it might be interesting to put together a GIF of the two cover versions, showing the differences in composition more clearly. 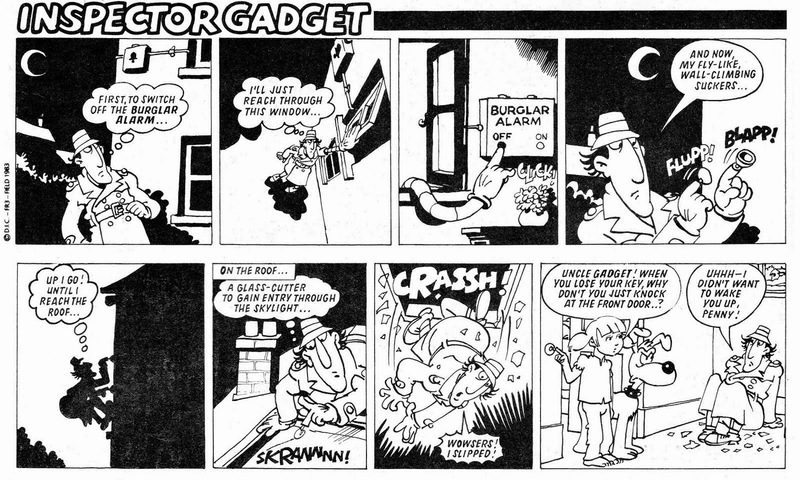 Aside from Gadget's mouth, which of them do you prefer? ..but this time I have to admit I disagree, and I think you are off mark. I'm of course talking about the smile. 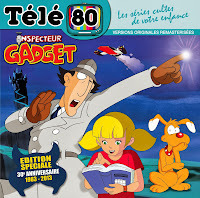 Yes, I personally rather enjoy the smile of Gadget. Even the crooked one. He should smile, its part of his job after all, and I think that instead of toning down the smile to NOTHING they should have really taken it to the next level instead, so to speak. It would make for a whole a more fresher and GRANDER experience for both the older fans, and give a welcoming appeal to newer audience. Here is my suggestion for fortcoming posterarts. 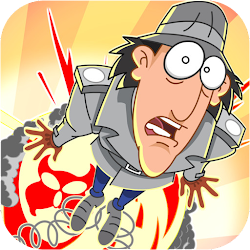 Its obviously Penny's smile that has been adjusted for Gadget, but still, doesn't it look frickin' great though? I'm not the one usually to blow my own horn, but this time, forget it! It looks awesome! He almost gets that Jokeresque from Batman look, but not so much that you can say its ripping of the Batman universe. Now I know the creators of this site claim they have no affliaition with the creators of the series, but come on, lets be honest, nobody ever believed that. Get working on it. Hi there, and thank you very much for the compliments! :) But I have to ask... do you really mean to say you don't love this site MORE than your own firstborn...? That stings, dude! "Now I know the creators of this site claim they have no affliaition with the creators of the series, but come on, lets be honest, nobody ever believed that." 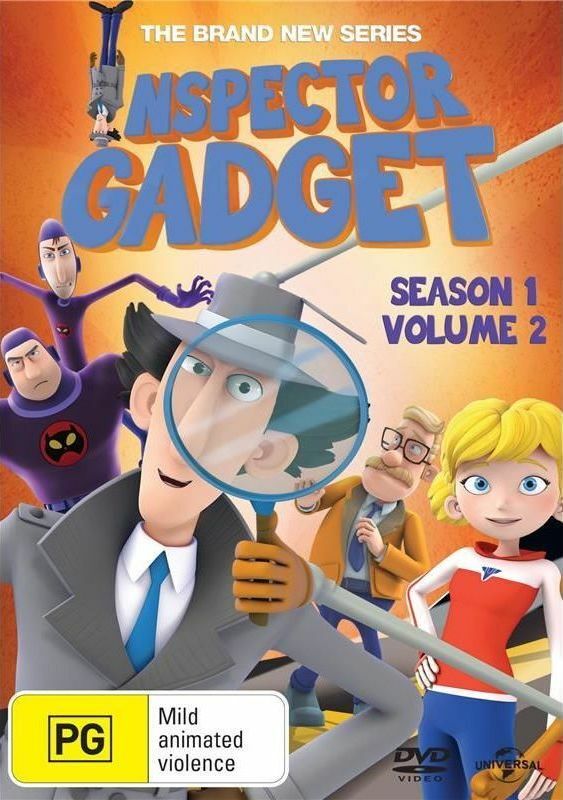 This is very flattering, of course, but I'm afraid I'll have to say... no, I don't have any affiliation with the company owning Inspector Gadget. And in the 4+ years this site has been active, only one person (me) has been writing it. Speaking seriously for a moment, I'd actually love to work on DVD editions etc. of the original 1983 series, because I honestly think I could make a difference in getting some of the rarer material included. 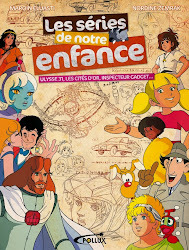 Like for instance the pilot episode: my research over the years tells me that there is likely four different, original versions of it in existence, but no DVD edition released in any country has ever bothered to include more than one version. And the pilot is just one point on my list. 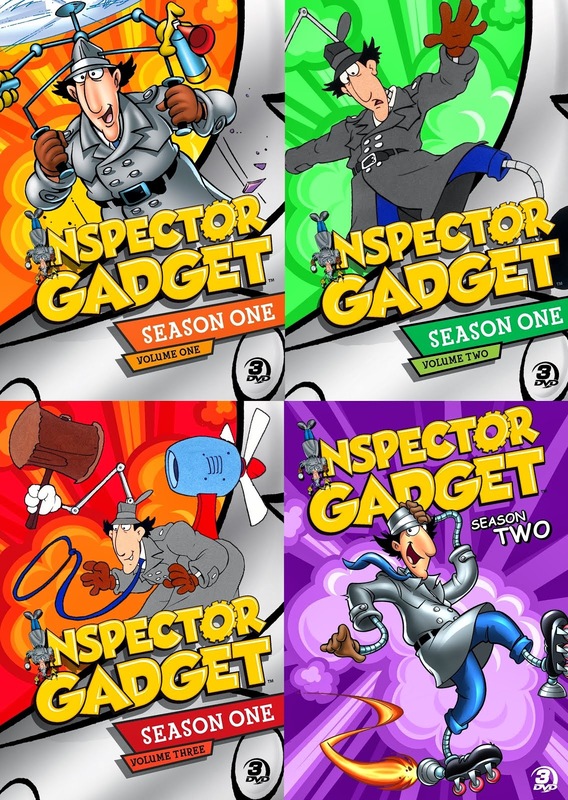 You don't necessarily need to spend huge amounts of money to get a better DVD edition of Inspector Gadget released... the most important thing is care. Oh yes, I know, know.. You're just ONE guy sitting alone in your office doing ALL THIS amazing STUFF. Sure, sure, believable. And NOT AT ALL some huge corporation, right, working around the clock at the people's service. Of course not! Oh, you know who else said the same thing? The Faraohs from Egypt way back in the day, for example. They said they made the pyramids all by themselves, and it was not like they had 1000 slaves or anything doing it for them. Very likely story the Faraohs did the pyramids all by themselves. But I'll leave that story to yourself and the gullible person who believes that. For now. This is not the moment to bite the hand that feeds, you see, and I apologize, as I'm a huge fan of your work both on the show and the site. (More than my firstborn even, actually.) I'm trying to pitch a good idea to you and your 1000 staff members(or whatever the number is, might be even more for all I know). So, If you are not going to add my smile idea to the new series you are making, could you at the very least consider add my ideas to the banner of the site? I mean, imagine this Mesterius, if that really is your name, having your site on all newspapers globally, with thousands upon thousands of visitors every minute just flowing in for the goodness? Sounds good right? I'm sure it does. Well, its just a quick banner-changing away! Or it, might be… and only one way to find out, right? This one is free. On the house. Hope you like it, and that it will be put to good use! And um, have a nice day, DIC--- uh, oh no, oh, I mean, uh, ONE GUY. "Oh yes, I know, know.. You're just ONE guy sitting alone in your office doing ALL THIS amazing STUFF." The site has been a personal project from day one. That said, though... I have some friends who are helping me out with stuff on occacion (other than the writing). Some of the future posts I've got planned here will reflect that. Yes! Yes Yes! The crooked smile! My beggings were heard. Praise the lord, as he is fantastic. As my old and now unfortunately dead grandmother used to say, "a crooked smile is still better than no smile at all.. and you better not lose it, or you're grounded!"